My most recent commission was for an album cover for Plausible Music. Done in cut paper style, the theme was retro pop French songs (France Gall, etc.). 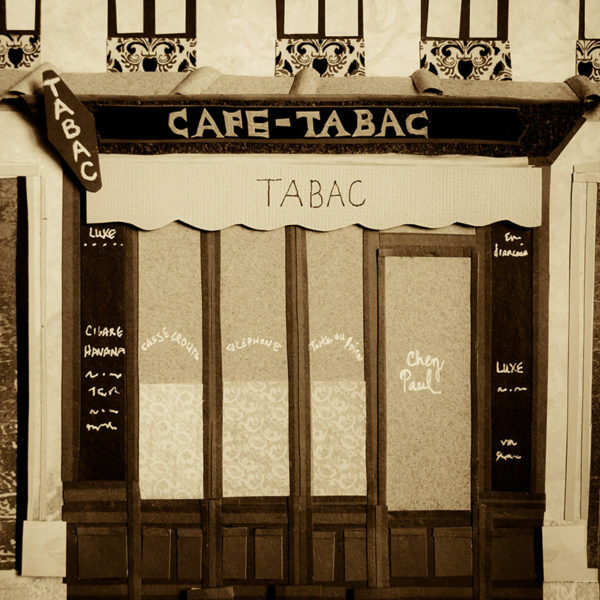 The Tabac/Café was created in paper and then scanned creating a vintage feel. Illustration for children's books, commercial and surface pattern design, Angelia works in many different forms of media from cut paper, traditional paints and digital. But one cou… Show more. Send a message directly to Angelia McLean. Illustration for children's books, commercial and surface pattern design, Angelia works in many different forms of media from cut paper, traditional paints and digital. But one could say it all started long ago with markers... Once upon a time there was a little girl who was grounded for drawing on her sister. Ever since she has stayed away from live substrates and pursues a variety of subjects. Putting anything to paper is a passion. How to describe her style? Perhaps whimsical and funny with subtle humor. Okay, maybe with a little sarcasm too... Angelia's variety of abilities in media and subject gives her a rich selection to offer art directors. She can go from abstract and cartoon-like to scientific illustration.